This song is taken from Hrithik’s one of the best movie Koi Mil Gaya which were successfully admire with Priety Zinta. Koi Mil Gaya song is sung by Udit Narayan and Chitra K S. Koi Mil Song Lyricist by Ibrahim Ashq and the music director of this song is Rajesh Roshan. 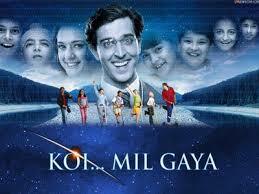 Here you will read Hrithik Roshan’s song Koi mil gaya lyrics with English translation. We hope that you will like the song with Lyrics which is accurately translated by us in English and Hindi. Haan Kaun Mil Gayaa Ch: Koi Mil Gayaa.. I found my reason for being. Yes? Who did you find? What happens to you when you meet me? The thing you're going to say, I know it too. Listen to me, won't you? You’re still near even when you go far away. Why don't I understand whatever this is that's happening? Yes, who did you find?